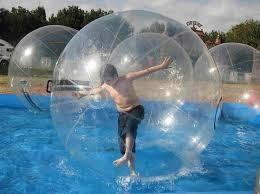 You may not be heavenly, but that shouldn’t stop you from walking on water thanks to this inflatable human hamster ball. At approximately 7 feet tall, the inflatable walk on water ball will provide hours of fun on the water. It also allows children and adults to run, roll and flip on water without getting wet. water walking ball is a large inflatable sphere that allows a person inside it to walk across the surface of a body of water.